demands of the telecommunications industry. PON OPTICAL NETWORK EQUIPMENT/END-TO-END PON SOLUTIONS INCLUDING HIGH QUALITY OLTS, ONTS, AND EDFAS. 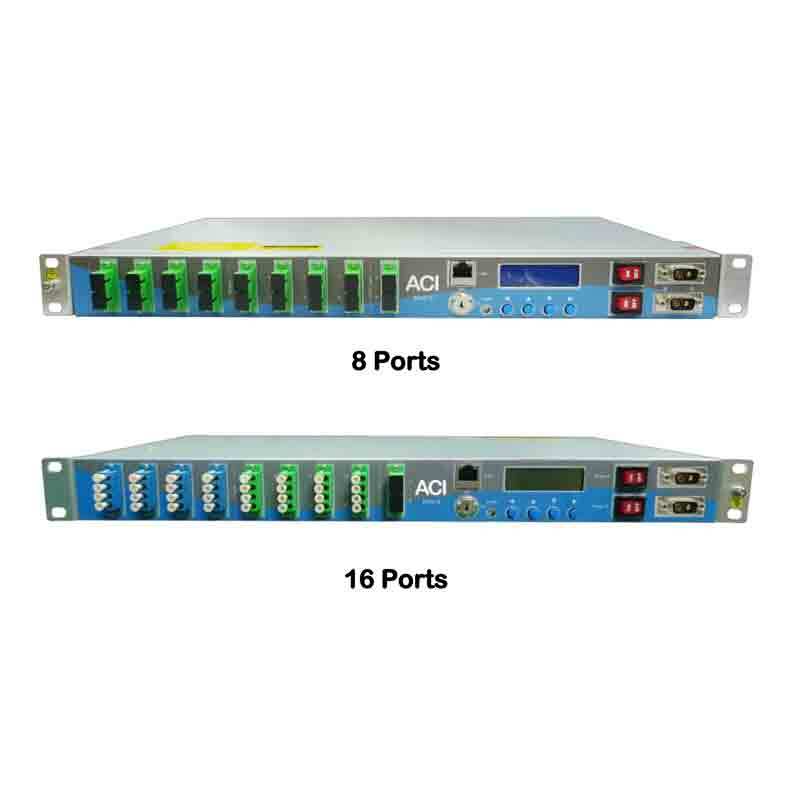 As a PON solution provider ACI has a full range of PON products including user expandable OLTs up to 96 ports. 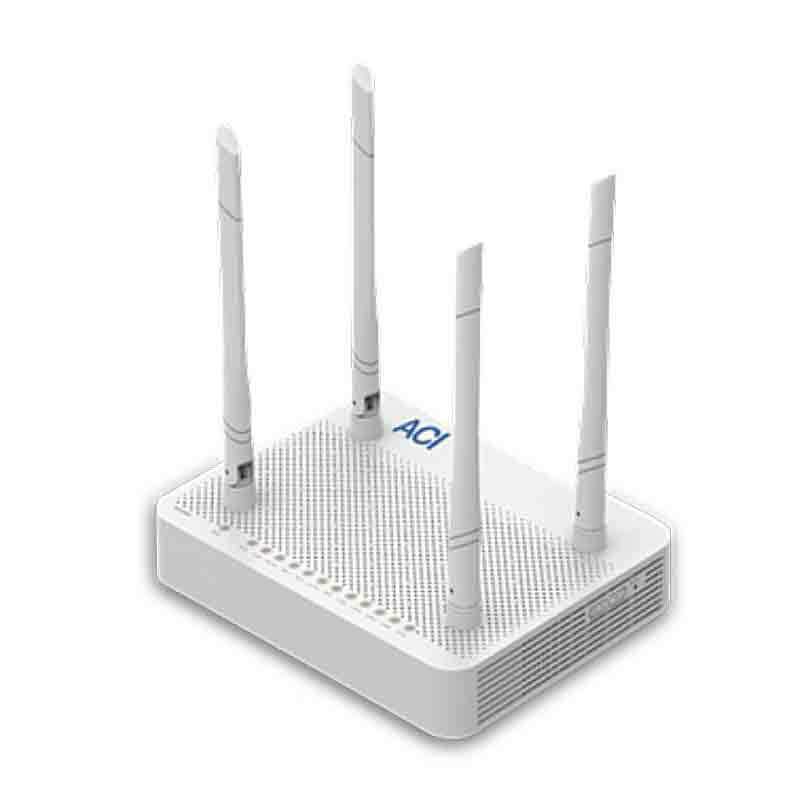 ACI carries the latest GPON and NGPON equipment including multi-port ONTs. ACIs PON solutions are expandable so there is no need to invest a large capital expenditure until needed giving users the best ROI possible. The customer premise equipment is a sleek modern design that consumers find attractive and provides all the options needed for the most flexibility, including an RF out if needed. The GEH39 is a 4-output port outdoor EDFA with an integrated 4-port GPON OLT module. The integrated WDM devices combine the GPON OLT IP signals of 1310 (upstream) and 1490 (downstream) with 1550 broadcasting signal in the same fiber for FTTX with an RF overlay network. The uplink wavelengths 1570 nm (upstream) and 1270 nm (downstream) can also pass thru to the OLT. A device management webpage is available for monitoring the station information and provides alarm functions in real time that can be accessed through the RJ45 interface. A WiFi connection is available to access the local device management webpage by using a smart phone, tablet or laptop computer. The RJ45 interface can also be used for remote SNMP network management through an Ethernet connection. 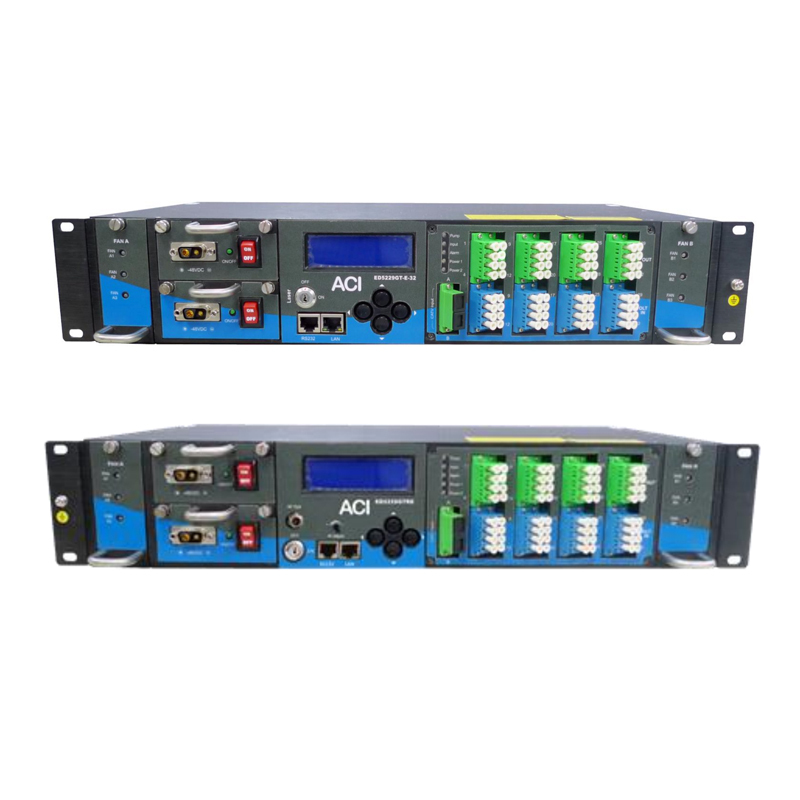 The LT504 is a compact GPON OLT system with 4 GPON output ports. The LT504 provides flexibility with 4 optical uplink ports (10GBase-T/1GBase-T) & 4 electrical uplink ports (100/1000 Base-T). This makes the LT504 and excellent solution to provide FTTx service to the areas that have a low density of population or a small number of subscribers with a low capital cost. 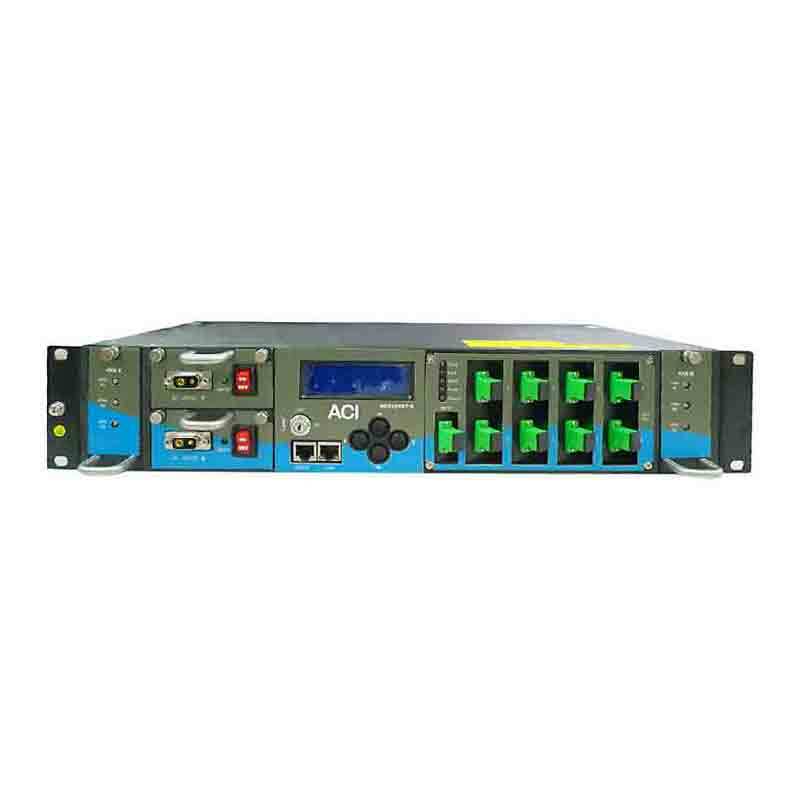 The LT508 is a compact GPON OLT system with 8 GPON output ports. The LT508 provides flexibility with 4 optical uplink ports (10GBase-T/1GBase-T) & 4 electrical uplink ports (100/1000 Base-T). This makes the LT508 and excellent solution to provide FTTx service to the areas that have a low density of population or a small number of subscribers with a low capital cost. 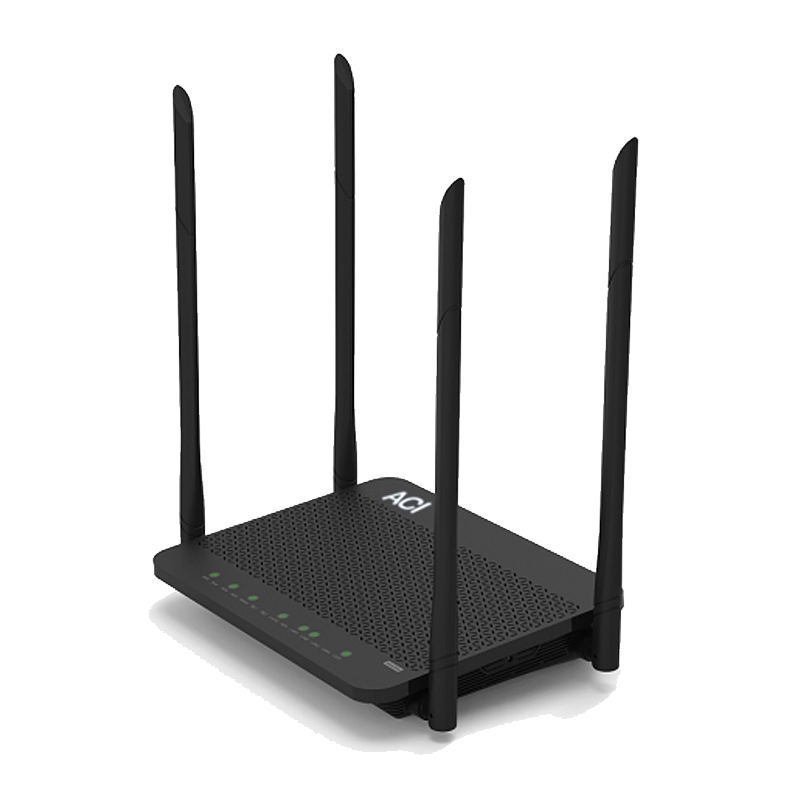 The LT516 is a compact 1 RU tall GPON OLT system with 16 GPON output ports. The LT516 provides flexibility with 4 optical uplink ports (10GBase-T/1GBase-T) & 4 electrical uplink ports (100/1000 Base-T). This makes the LT516 and excellent solution to provide FTTx service to the areas that have a low density of population or a small number of subscribers with a low capital cost. The LT802 is a 2RU height chassis based GPON OLT system with 4 slots for 2 service modular units, 2 switching fabric unit with Uplink module to deliver a wide range of full-featured and high-performance over FTTx applications. It is a high-density chassis system that supports up to 4,096 residential and business subscribers with 32 GPON ports (1:128 split ratio). The most compact type GPON OLT Chassis system as supporting GPON Protection in worldwide. 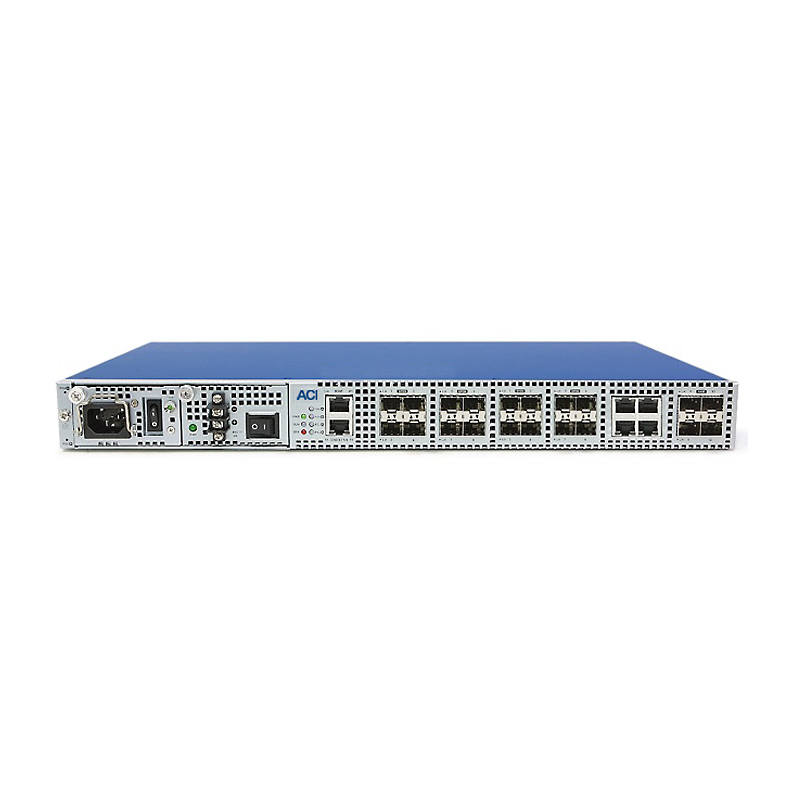 LT802 features high capacity GPON access and 10GbE uplink and line rate performance with a 320Gbps non-blocked switch fabric. 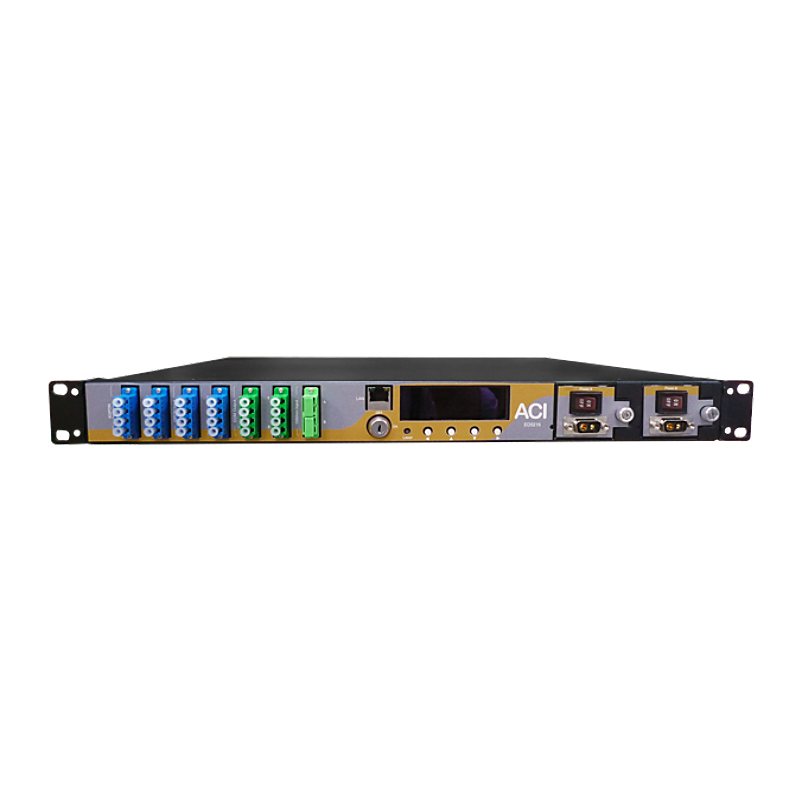 The LT806 is a 6RU height chassis based GPON OLT system with 10 slots for 6 service modular slots, 2 switching fabric slot and 2 uplink slots for delivering a wide range of full-featured and high-performance over FTTx applications. 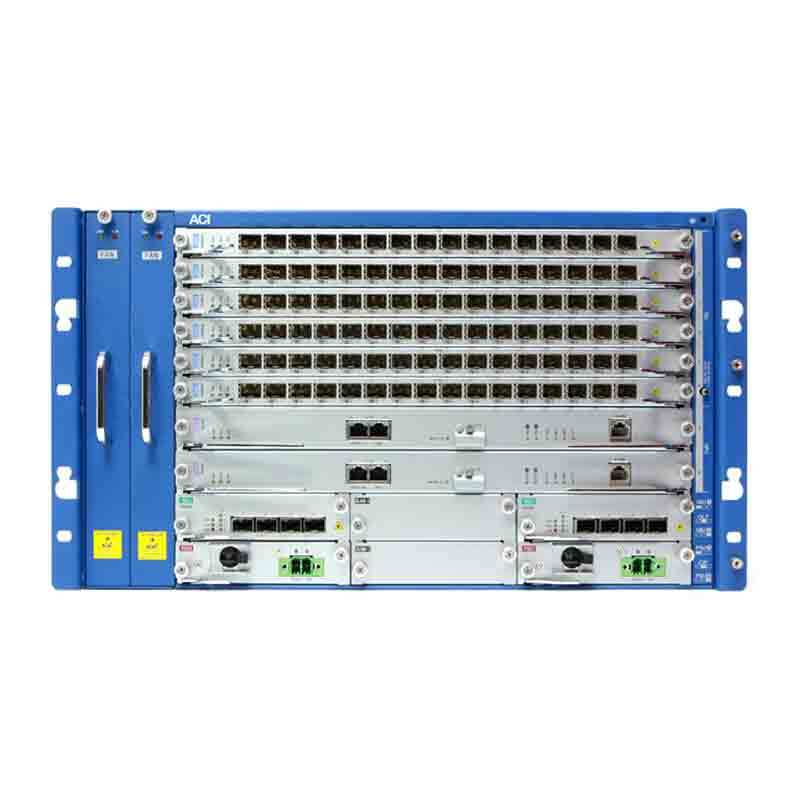 It is a high-density chassis system that supports up to 6,144 residential and business subscribers with 96 GPON ports (1:64 split ratio). The most compact type GPON OLT Chassis system supporting GPON Protection worldwide. 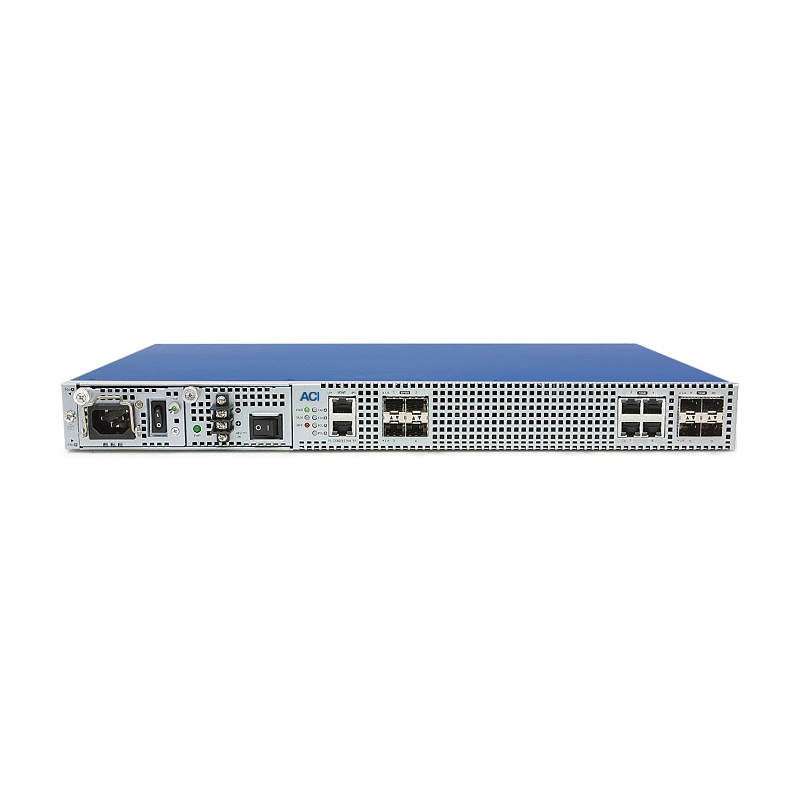 LT806 features high capacity GPON access and 10GbE uplink and line rate performance with a 960 Gbps non-blocked switch fabric. 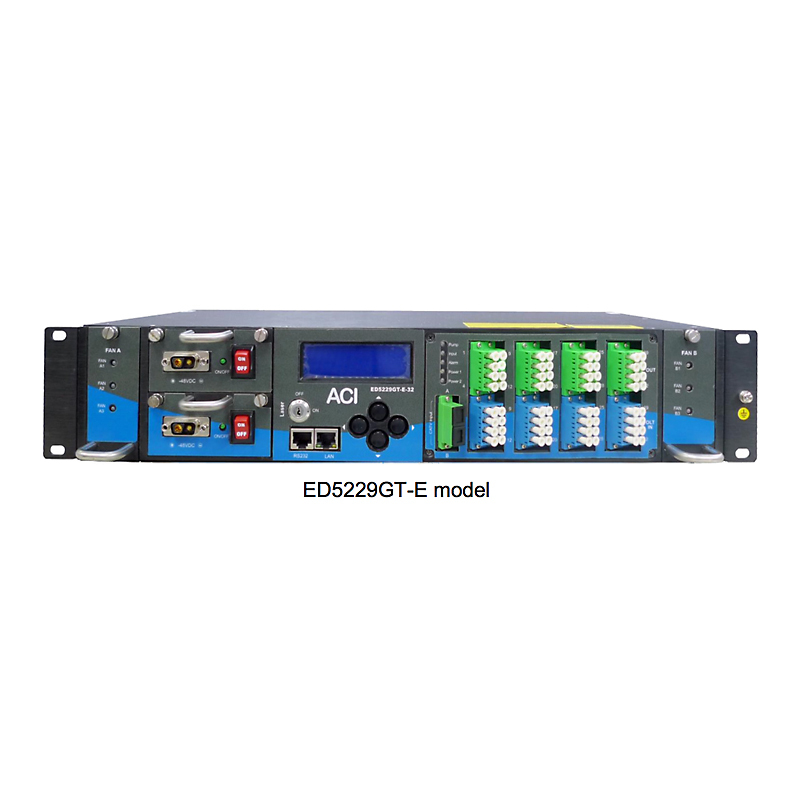 The ED5229GT-E series is a high-power multi-ports EDFA optical booster with gain spectrum bandwidth from 1545 to 1563 nm for HFC network. It is designed for the amplification of CATV 1550 nm single channel or multi-channel wavelengths (ITU wavelength) with WDM for IP (OLT) signal overlay. It has WDM devices integrated for combing GPON (IP) signals of wavelengths 1310 nm (upstream) & 1490 nm (downstream) with 1550 nm broadcast signal in the same fiber. It is also specially designed with high grade components for operation in the temperature range from -5°C to +65°C which is suitable for both indoor and outdoor cabinet environment. The ACI ED5229GP series is a high-power multi-ports EDFA optical booster with gain spectrum bandwidth from 1545 to 1563 nm for HFC network. It is designed for the amplification of CATV 1550 nm single channel or multi-channel wavelengths (ITU wavelength) with WDM for IP(OLT) signal overlay. the integrated WDM devices is used for combing GPON (IP) signals of wavelengths 1310 nm (upstream) & 1490 nm (downstream) with 1550 nm CATV signal in the same fiber. This series of EDFA offers a flexible solution for CATV large area coverage of metropolitan and medium-size cities. The ED5229ST EDFA is a single channel EDFA designed to amplify channels in the wavelength range from 1545 nm to 1563 nm. The ACI ED5229ST EDFA is designed to operate in an outdoor cabinet environment with a temperature range from -5˚C to +65˚C. The monitoring alarm functions and system information are provided with a real time display on the front LCD panel and LED indicators The RJ45 connection is for the SNMP management, and the RS232 connection is used for local remote control. 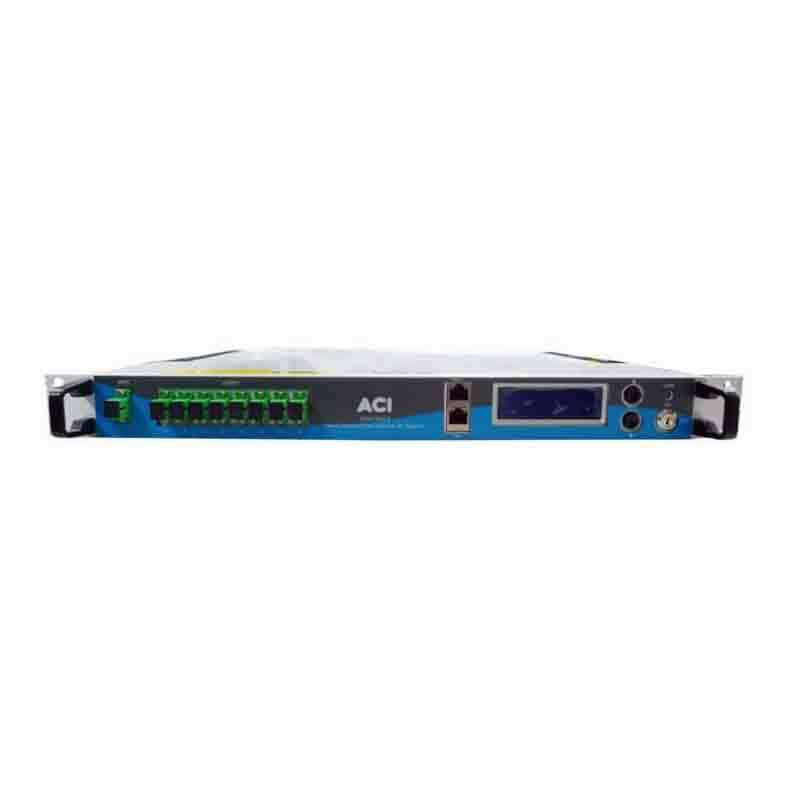 The ACI ED5219LGT series is a high-power multi-ports EDFA optical booster with gain spectrum bandwidth from 1545 to 1563 nm for HFC networks. It is designed for the amplification of CATV 1550 nm single channel or multi-channel wavelengths (ITU wavelength) with WDM for IP (OLT) signal overlay. It has WDM devices integrated for combing GPON (IP) signals of wavelengths 1310 nm (upstream) & 1490 nm (downstream) with 1550 nm CATV signal in the same fiber. ED5219LGT series is also specially designed with ruggedized components for operation in the temperature range from -5˚C to +65˚C which is suitable for both indoor and outdoor cabinet environment. The monitoring, alarm functions and system information are provided with real time display on the front LCD panel. The RJ45 connection is for the SNMP management, and the RS232 connection is used for local remote control. 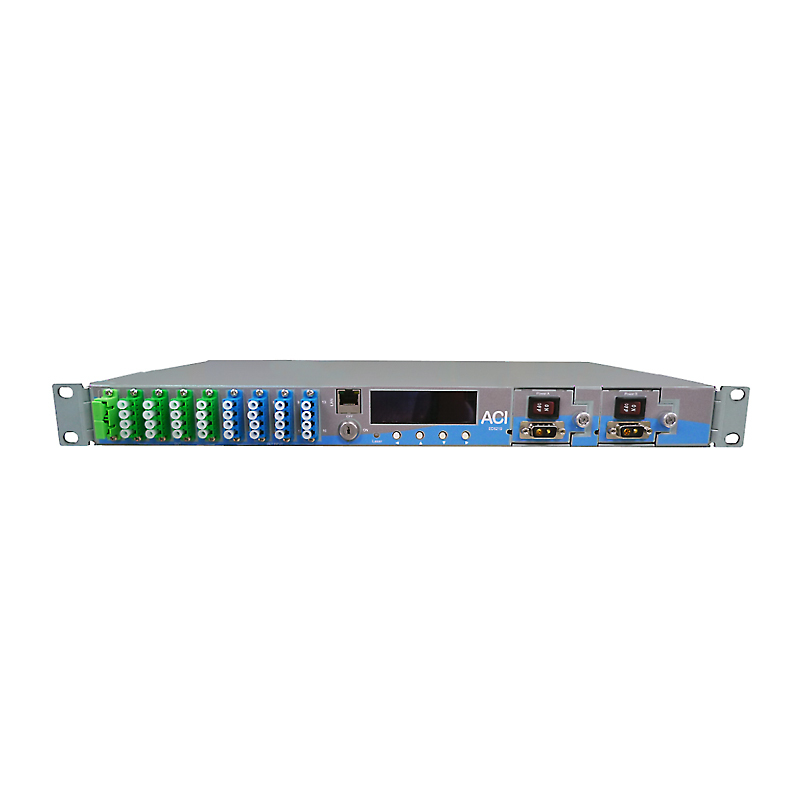 The unit is 1 RU in height and can be mounted into a 19″ wide headend rack. The ED5219LGT series is a high-power multi-ports EDFA optical booster with gain spectrum bandwidth from 1545 to 1563 nm for HFC networks. 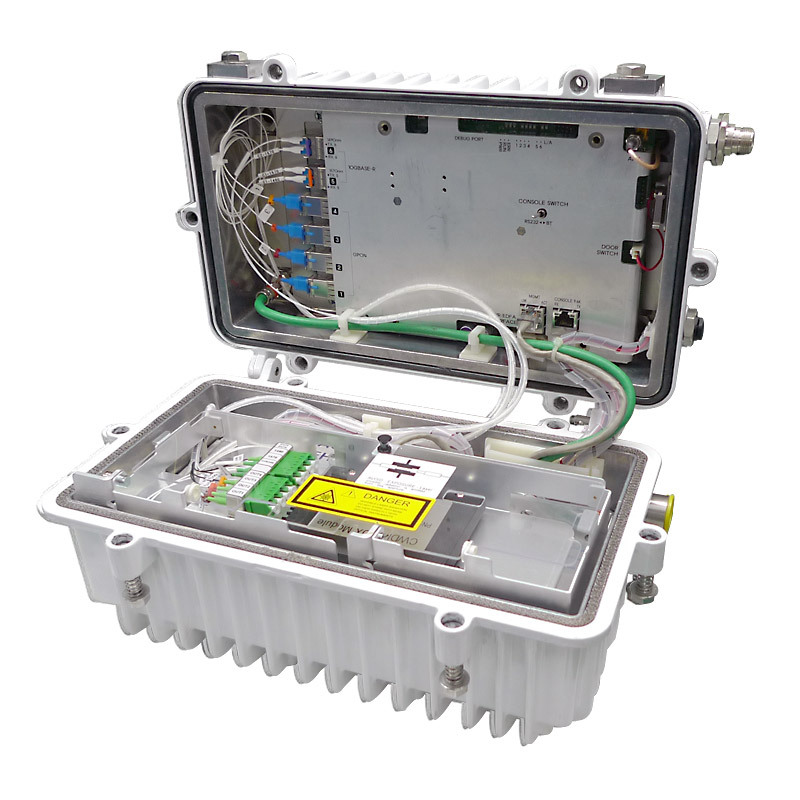 It is designed for the amplification of CATV 1550 nm single channel or multi-channel wavelengths (ITU wavelength) with WDM for IP (OLT) signal overlay. It has WDM devices integrated for combing GPON (IP) signals of wavelengths 1310 nm (upstream) & 1490 nm (downstream) with 1550 nm CATV signal in the same fiber. ED5219LGT series is also specially designed with ruggedized components for operation in the temperature range from -5˚C to +65˚C which is suitable for both indoor and outdoor cabinet environment. The ED5219LGT series is a high-power multi-ports EDFA optical booster with gain spectrum bandwidth from 1545 to 1563 nm for HFC networks. It is designed for the amplification of CATV 1550 nm single channel or multi-channel wavelengths (ITU wavelength) with WDM for IP (OLT) signal overlay. It has WDM devices integrated for combing GPON (IP) signals of wavelengths 1310 nm (upstream) & 1490 nm (downstream) with 1550 nm CATV signal in the same fiber. The ED5219LGT series is also designed for operational temperature range from -5˚C to +65˚C for use in outdoor cabinets. The ED5219LXGT-16 series is a low noise high performance multi-port optical amplifier with a gain spectrum band of 1545 to 1563 nm. 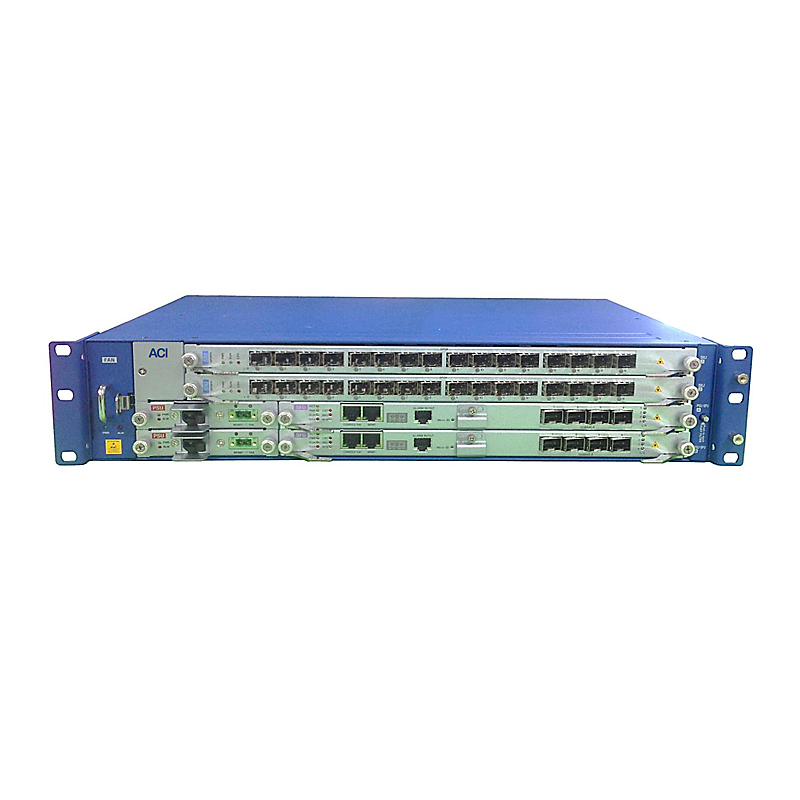 Each optical amplifier output port has a high quality CWDM Mux. The external up-link optical ports can connect with OLT PON ports. The 1550 nm output optical port multiplexes with 1310/1490 nm (GPON) or 1270 nm/1577 nm (XGPON) data stream. With this port configuration the number of devices needed is reduced that improves the performance index and reliability of the system. It also has a built-in 2x1 optical switch for 1550 nm input backup redundancy. The NU60GM optical network terminal is targeted for all subscribers requiring multiple POTS, RF interface, and high-speed data interfaces in a cost-effective indoor housing. Fully compliant with ITU-T G.984 standards, the NU60GM supports data rates of 1.25Gbps upstream and 2.5Gbps downstream. With ACI’s leading-edge GPON technology, users can enjoy bandwidth-intensive multimedia services such as real-time audio, video and gaming much easier and faster than ever before. The NU60RM optical network terminal is targeted for all subscribers requiring multiple POTS, RF interface, and high-speed data interfaces in a cost-effective indoor housing. Fully compliant with ITU-T G.984 standards, the NU60RM supports data rates of 1.25Gbps upstream and 2.5Gbps downstream. 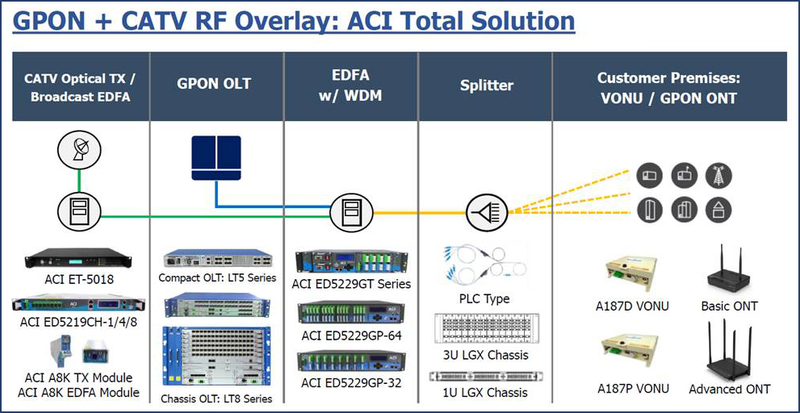 With ACI’s leading-edge GPON technology, users can enjoy bandwidth-intensive multimedia services such as real-time audio, video and gaming much easier and faster than ever before.